The product is made of high quality stainless steel and manufactured by precision machining. 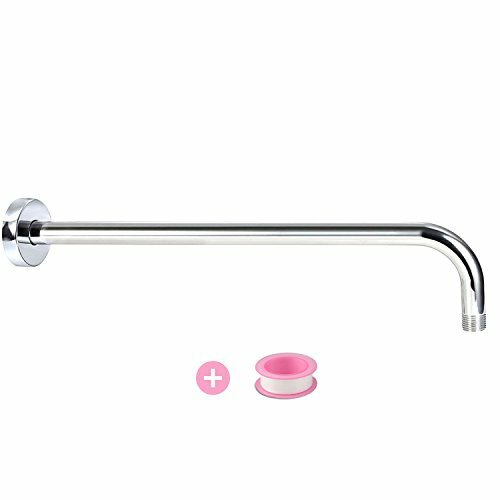 The shower arm is integrated and has super stability, corrosion resistance and oxidation resistance. The internal and external Interfaces are all 1/2 standard, which can be used for most equipment. The five layer of electroplating makes the product bright and glossy. If the product takes too long to appear dirty, the rag can be restored as rubbed. Made of stainless steel ensures durability and long service life. The surface is chrome plated, which makes the surface smooth and mirror like. It contains flange and raw meal tape and can be easily completed without additional installation tools. ½"NPT standard connection is suitable for most interfaces and can be perfectly connected. Easy to clean. You can remove dirt only by gently rubbing it with water.